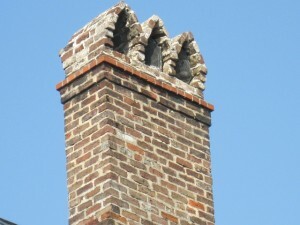 A famous old look on Charleston roof tops comes from the numerous chimneys “capped” with brick arches open on the sides. The look is distinctive, but the idea is very functional, keeping smoke from backdrafting down the chimneys in the pre-electricity days when ciy houses were heated by coal and wood-burn ing fireplaces. The brick chimney cap was also sensible preventative against flaming embers that could easily ignite the layers of coal tar or creosote that would build up on the inner walls of the structure from hearths below. Concern over the combustible capability of chimneys was considerable, and city ordinances in the 18th century created “chimney inspectors”,who had the power to enter private property for the purpose of determining whether chimneys were safe. These inspectors could compel property owners to have their chimneys swept, which was done until well into the 20th century by small boys known as “sweep boys”. Sweep boys would crawl into fireplaces and squeeze their way up through the narrow chimney passages, scouring with bristled brushes to the roof. An ordinance in 1842 set maximum sweep rates at 6 3/4 cents per floor after a threatened strike by chimney sweeps actually prevailed over Charleston. 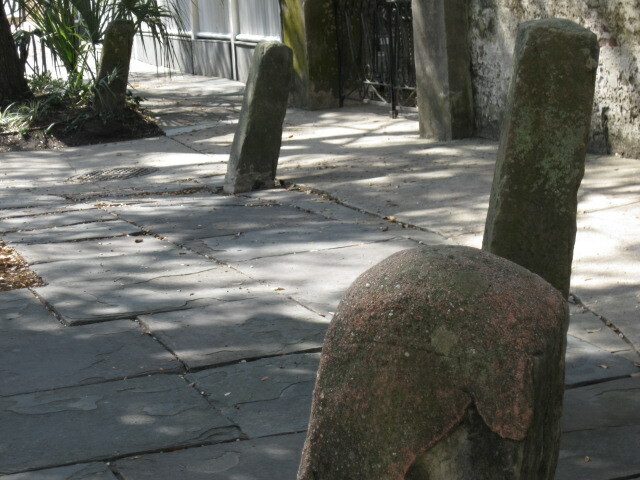 An unusual row of small structures stands mysteriously on lower Church Street, confounding Charlestonians for years as to its origin and purpose. Four masonry posts, made of limestone covered with stucco, protrude from the sidewalk south of Water Street like oversized stalagmites, raising the curiosity of all passersby. The four posts stand in front of the George Eveleigh house at 39 Church Street, which was built when Water Street was still Vanderhorst Creek. One plausible theory is that the posts were installed as docking bollards for flat-bottomed boats pulled up in the high marsh near the house. There is also a significant bend in Church Street in front of the Eveleigh house, and when the thoroughfare was being laid out, the posts also could have been put up as a barrier against horses and carriages going past, or equipped with rings for animals to be tethered. 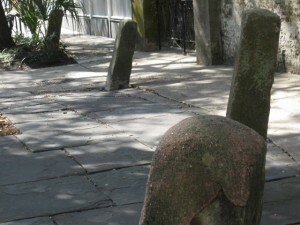 One notable oddity about the posts is that they lean to the west, an aspect that might be explained by a hurricane that severely the damaged the house in 1811, with wind and water surging from the east that may have affected the stand of the stones. Then again, the lean in each post is nearly uniform, suggesting that perhaps they were linked at one time with a metal bar or wooden slats that may have pushed them over from the force of the earthquake that struck Charleston in 1886. In any case, no one really knows why the posts are there, and like England’s Stonehenge, these posts from the past remain a mystery.